McEvoy signed on with the Bills' practice squad Wednesday. Analysis: McEvoy will work with the team in the event one or more of the Bills' active wideouts is unavailable. Even if he manages to crack the 53-man roster before the season closes out, McEvoy's main duties would come on special teams. The Dolphins placed McEvoy on waivers Tuesday, Field Yates of ESPN reports. Analysis: The former Wisconsin product has now been waived three times in the last month, as McEvoy lately has struggled to find his footing in the NFL. He has 14 receptions for 253 yards and two scores across two seasons, and at just 25 years old, he should have a couple of potential suitors. McEvoy was waived by the Saints on Saturday and claimed by the Dolphins on Sunday, freelance NFL reporter Dov Kleiman reports. 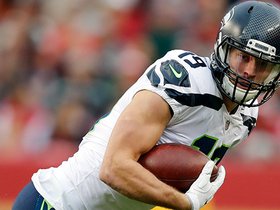 Analysis: McEvoy has now been on three teams in the past week since initially being waived by the Seahawks. McEvoy proved to be a utility guy capable of playing multiple positions, but it's unclear as of now how the Dolphins plan on using him or if they plan on keeping him for their 53-man roster. McEvoy signed with the Saints on Wednesday, Mike Triplett of ESPN.com reports. Analysis: Primarily used as a utility man in Seattle, McEvoy is capable of filling various needs. 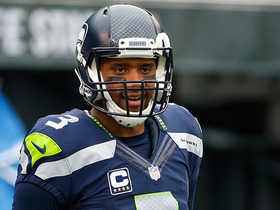 The former college quarterback has valuable experience on offense, defense and special teams. McEvoy will have only a limited timeframe to make a case for a roster spot in New Orleans, but his versatility could work to his benefit. 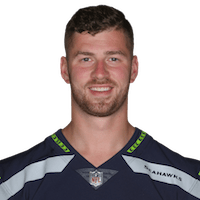 The Seahawks waived McEvoy on Saturday, Jason La Canfora of CBS Sports reports. Analysis: A preseason star in 2016, McEvoy no longer made the cut in a crowded receiver room. He caught five passes for 113 yards last season, and he'll have plenty of time to find another team before Week 1 kicks off. McEvoy (coach's decision) is inactive for Sunday's game against the Cardinals. Analysis: McEvoy will be held out for the first time of the campaign, a decision that was likely on the horizon after he played a season-low six offensive snaps in the Week 16 loss to the Cowboys. 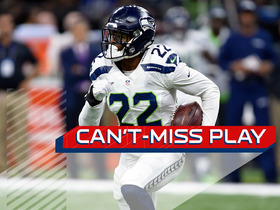 Amara Darboh and David Moore will dress as the Seahawks' reserve wideouts behind starters Doug Baldwin, Paul Richardson and Tyler Lockett. McEvoy (hamstring) is listed as active for Sunday's game against the Redskins. Analysis: McEvoy has just one reception this season, but it's a big one, a 53-yard haul against the Texans in Week 8. He's a talented, young receiver, but he nevertheless sits as the No. 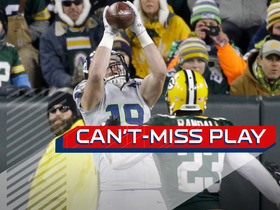 4 wideout in Seattle, limiting his fantasy production. 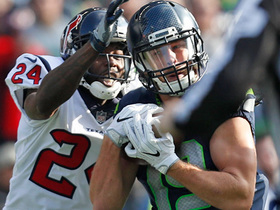 McEvoy is questionable for Sunday's game against the Redskins due to a hamstring injury, John Boyle of the Seahawks' official site reports. Analysis: The hamstring issue prevented McEvoy from logging anything more than limited involvement in practice this week. McEvoy has roughly split his playing time between offense and special teams this season, but he made the most of his lone reception of the campaign in the Week 8 win over Houston, hauling in a 53-yard touchdown. In spite of his heroics last week, McEvoy shouldn't see a notable uptick in targets if he suits up Sunday. 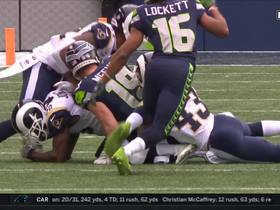 Los Angeles Rams linebacker Alec Ogletree recovers a fumble by Seattle Seahawks wide receiver Tanner McEvoy. Seattle Seahawks wide receiver Tanner McEvoy shakes off 49ers' defender for 24-yard gain. 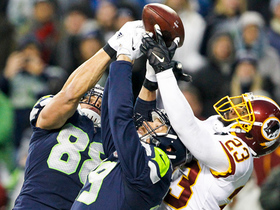 The Seattle Seahawks' last-second Hail Mary attempt nearly succeeds. Seattle Seahawks quarterback Russell Wilson goes deep to wide receiver Tanner McEvoy. 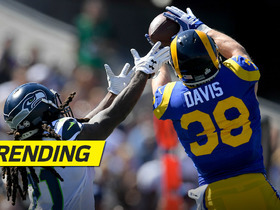 Los Angeles Rams safety Cody Davis intercepts Seattle Seahawks wide receiver Tanner McEvoy's pass. Seattle Seahawks quarterback Russell Wilson finds wide receiver Tanner McEvoy for a 21-yard touchdown. 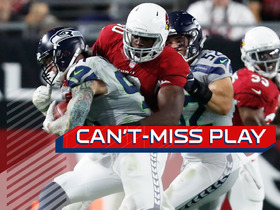 Seattle Seahawks wide receiver Tanner McEvoy blocks Arizona Cardinals punter Ryan Quigley's punt at a critical time period in the 4th quarter and the Seahawks recover the blocked punt. Seattle Seahawks QB Russell Wilson finds wide receiver Tanner McEvoy for 42-yard TD on his first NFL reception.